Now that the kids are back to school and the after school activities have started up again, weeknights are busier than ever. With a little planning and preparation, a delicious and quick dinner can make it to the table in 20 minutes - beginning to end. Grab a bunch of kale and an inexpensive flank steak on your next trip to the market. 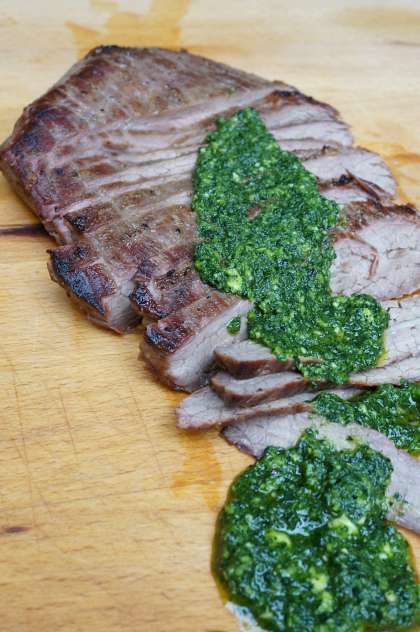 Create a deliciously simple flank steak with kale pesto that everyone in your family will love. In the morning, prepare the marinade for the steak. 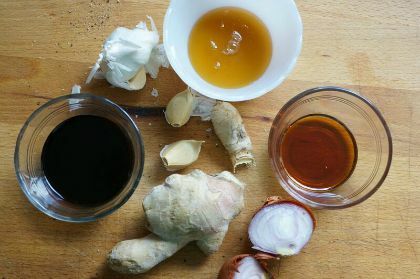 Combine soy sauce, honey, sesame oil, 1 garlic minced garlic clove, grated ginger and pepper in a large plastic resealable bag. Add in the steak and place in the fridge to marinade all day long. At dinnertime - pull the steak out of the fridge and place it on the counter, to come up to room temperature. Preheat the oven to broil. Line a baking sheet with foil and set aside. 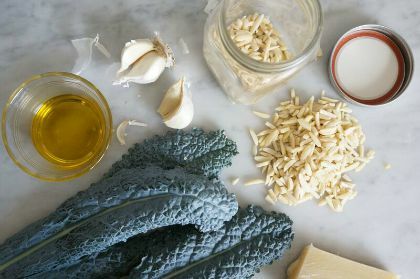 Prepare the kale pesto by adding kale, garlic, cheese and almonds to a food processor. Process until everything is finely chopped. 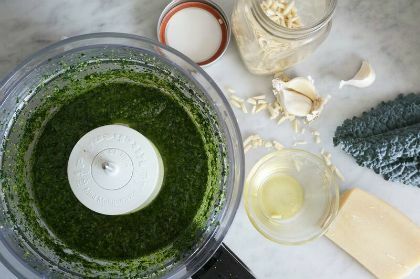 Pour in olive oil, with processor turned on, until pesto reaches your desired consistency. Thinner pesto will need more oil. Set aside. Remove steak from marinade and place on baking sheet. Pop steak into preheated oven for 5 minutes a side for medium doneness. Let steak rest for 5-10 minutes before slicing. Thinly slice the flank steak, be sure to slice across the grain of the meat to achieve the most tender pieces of meat. Serve steak with the pesto and a side salad. Get the kids to help you make these fun crackers instead of reaching for the candy! Halloween is all about costumes and candy - lots of candy. Perhaps a bit too much candy? The candy struggle can be especially difficult when you have little ones. They want to get in on all the Halloween fun, but you might not want them to indulge in that much sugar. Here is the answer - Homemade Halloween cheesy crackers. Kids love cheesy crackers - goldfish, bunnies and penguins. I've come up with a simple recipe for making your own crispy cheesy crackers that can be made into any shape you like. Grab the Halloween cookie cutters - we chose a bat and a black cat - and bake up a batch with the kids. These crackers puff up and have a deliciously deep cheese flavour. Kids will have fun dipping them in soup or eating them as a snack on their own. Homemade Halloween cheesy crackers make a fun, healthy alternative to Halloween treats. 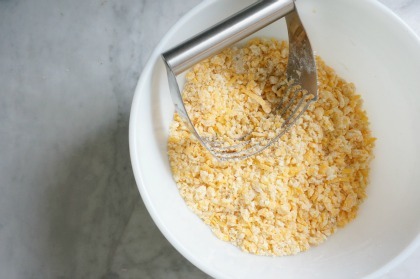 In a large bowl, cut cold butter into flour. Use a pastry cutter to cut in butter, until the texture is like small peas. Use the pastry cutter to cut in the cheese, add the cheese in 2 batches - not all at once. Again the texture will appear coarse. Add 3 or 4 tbsp of water. The water will bring the dough together. Form a ball of dough and wrap dough in plastic wrap and place in fridge for at least 1 hour. After an hour, the dough will be firm. Roll out the dough, on a lightly floured surface. Roll it 1/8" thick. 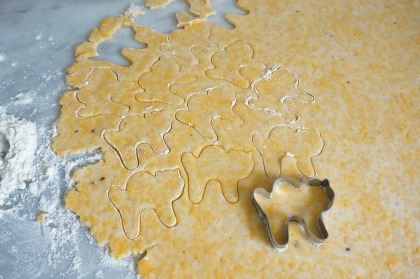 Use floured cookie cutters to make desired shapes. We used cats and bats. Bake crackers on a parchment lined baking sheet, in a 400°F oven for 20 minutes. Crackers will have puffed up and be lightly golden on the bottom. These crackers would make a great healthy addition to a school Halloween party, or package a few in a little bag and hand them out to trick-or-treaters. Store them in an air tight container and they should last 5-7 days. After a few days they might start to lose their crunch - but they are still delicious. What healthy Halloween treats do you kids like? Watch out turkeys; we are heading into turkey eating seasos! It is time to brush off those basters and get roasting. The best part about making a huge roasted turkey for a big family gathering has got to be the leftovers. Do not throw those turkey leftovers away. 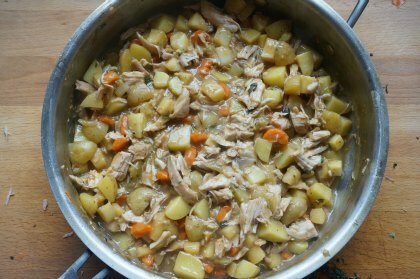 Turkey leftovers are so versatile and can be stretched for many meals to come. Do you remember the episode of Friends (am I dating myself) when someone in the office ate Ross' turkey leftover sandwich and he lost his mind?! Turkey leftovers are gold. Now, what to do with those bits of turkey meat you ask? 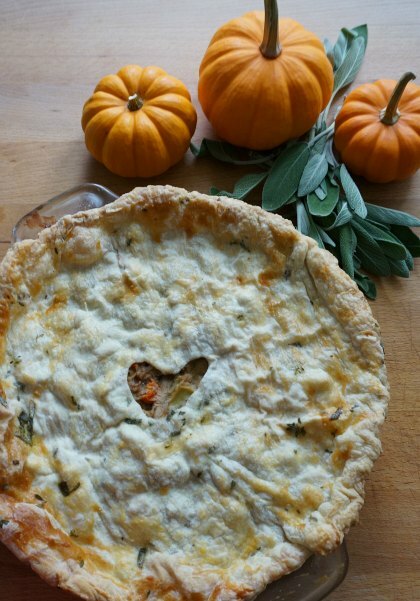 Bring together all the flavours of the holidays in a delicious turkey pot pie. To make things a little bit easier we skipped the homemade pie crust and used a sheet of store bought puff pastry instead. The puff pastry give this traditional recipe a light, crispy and golden topping. In a large saute pan, cook chopped bacon over medium-high heat, until fat has been rendered and bacon is crisp. Remove bacon. 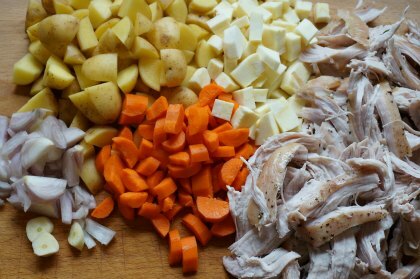 Add potatoes, parsnip and carrots to the saute pan. Cover pan and let cook for 10 minutes, until vegetables start to soften. Add onion, garlic, sage and thyme. Cover and let cook an additional 5 minutes. Add turkey to the pan. Check vegetables, if they are still firm, cover and let cook an addition 5-10 minutes. 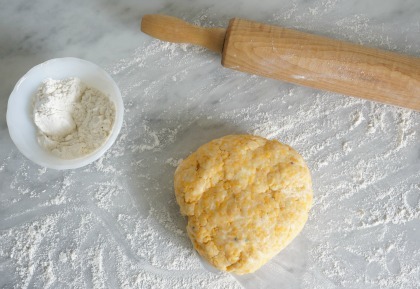 Stir in 2 tbsp of flour...stir until flour is evenly dispersed in mixture - no clumps of flour. Pour in 2 cups stock, chicken or turkey, and stir. Sauce will start to thicken. Bring to the boil and then turn down to a simmer. Let simmer for 10 minutes - stir often. In the meantime, roll out the puff pastry on a lightly floured surface. Mix 1 tsp of sage and 1 tsp of thyme into the flour. As you roll the puff pastry the herbs will be pressed in. Scoop turkey filling into a deep dish pie plate, or a shallow baking dish. 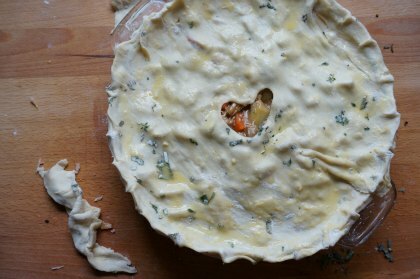 Place puff pastry on top of filling, be sure to cut a hole in the middle of the pastry - this will let the steam vent out as the pie cooks. Brush a beaten egg onto the pastry, this will give the pie a lovely brown colour when it is baked. Bake in a 400°F oven for 25-30 minutes, until puff pastry is puffed and golden brown and filling is bubbling.